Two percent? I found that hard to believe. Were they actually suggesting that if you took a random group of one hundred people on John Street (pedestrians, drivers, and cyclists) that only TWO would be on a bike? Even stranger was that for EVERY SINGLE time period of the week (morning, evening, weekend, weekday) their data remained the same. 2%. All the time. This lead to me to a simple conclusion: The math was completely fabricated. They didn’t actually count. So, I decided to organise a community-driven traffic count. I was going to do it last year, but I’ve been awfully busy flying kites. So almost 12 months later, I finally got down to business. Step One was to find out what those hand-held clicker things were called (‘tally counters’), and where I could buy some (Staples). 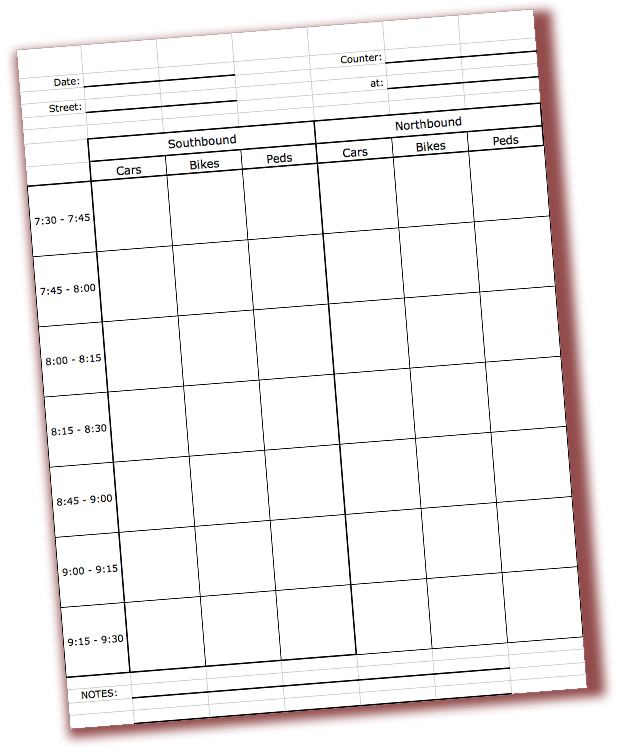 Step Two was to make some simple traffic-counting forms. 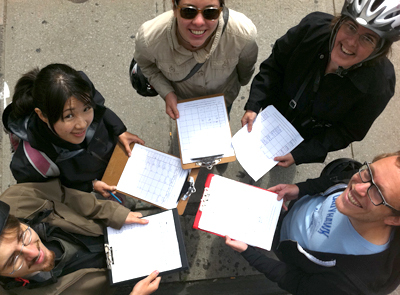 Step Three was to find an all-star team of volunteer traffic counters! Seven people signed up to help, mostly from the Toronto Cyclists Union. Step Four was to feed the volunteers with coffee, cookies and muffins as they clicked away for two solid hours. 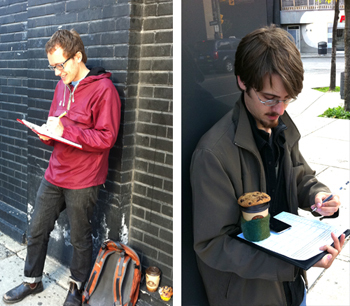 We measured from 7:30am to 9:30am, collecting data at 15-minute intervals. 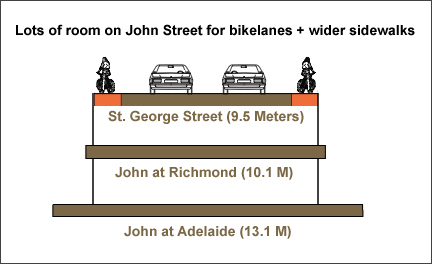 We were seeking the modal share breakdown for John Street, but also getting comparative counts of bike traffic on Peter, Duncan and Simcoe. Step Five was to take all the collected data, and make pretty charts and graphs. To be honest, I got cold feet before the count. I was worried that all of this effort might just confirm the original data. What if it really was only two percent? I crossed my fingers and prayed that we would find bike ridership to be in the range of at least 10 percent. Maybe, just maybe, if we were lucky, it might even hit 15%. Or, dare I suggest, 20%? 32% • Average for cyclists over two hours, southbound at Richmond. 37% • Highest level of cyclists during a 15 minute period at Richmond. 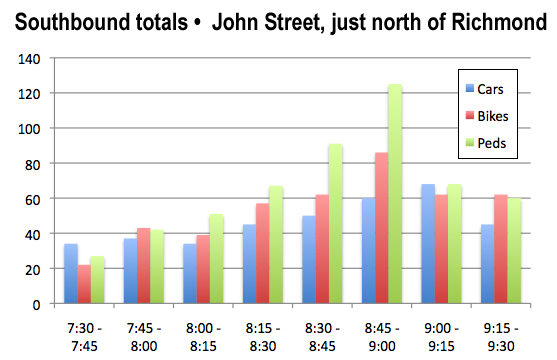 50% • Average for bikes over 90 minutes, southbound, north of Queen. In almost every 15 increment, there were MORE bikes than cars! Sometimes, there were more bikes than cars OR pedestrians. What’s most worrisome is that this data was being used as part of a public consultation process, to guide decision-making. What’s the point of having a consultation, if the data is actually misleading the public rather than informing them? 1) How does the city collect data? And how can we re-build trust in these numbers? 2) What role do private consultants play, and how are they regulated/supervised? 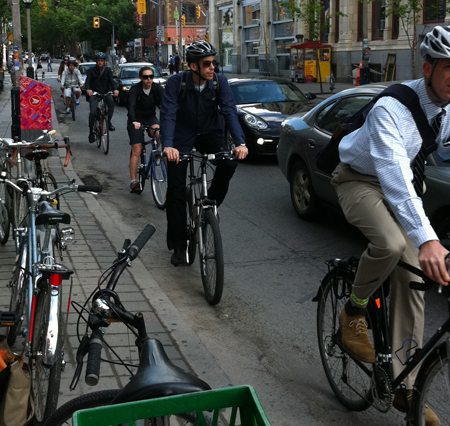 3) Why do we STILL have an anti-bike attitude in our urban planning community? When will the 1950s end in Toronto? 4) How can we ensure that roads are being designed for ALL users, rather than just two modes (pedestrians and cars)? These questions should be answered, before we re-design ANY roads in our city. The way we design our streets has a huge impact on our lifestyle, our environment and our safety. When a street is being re-designed, all stake-holders should be consulted, and they deserve a fair process and good data. What we saw yesterday was a river of bikes. Over 700 human bodies flwoing through the Entertainment District in two hours. These folks deserve safe streets, including a safe network of bikelanes in the core. And they deserve respect from the City and the processes we use to engage residents in decision-making. 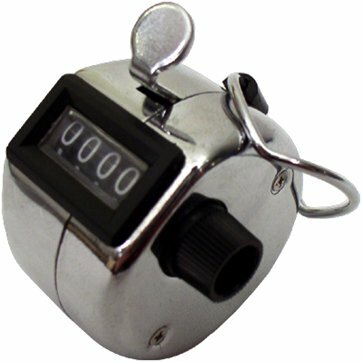 One last question: I spent $30 on tally counters. Who can I send the bill to at City Hall? Thank you for this work Dave. All of your questions are extremely important. The truth has nothing to do with the policies in this town. I heard Doug Ford on the radio this morning touting the selling of naming rights to corporations for city parks and landmarks. Can we hold a referendum to have Etobicoke naming rights sold to KY or Preparation H so Ol’ Doug becomes the Councillor for KY? With that attitude I doubt they will pay any attention to your traffic count. Thank you though from the bottom of my heart for doing it. Don’t forget to send the bill for coffee and muffins. Oh, wait. That went out with the gravy train. Too bad you didn’t supply Caramilk bars and roses, apparently that’s still a go with the FFord Bros. 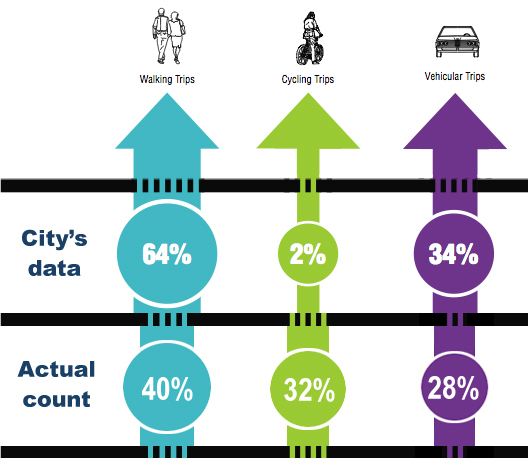 While I’d be skeptical of the city’s data this “study” done by Meslin and co is by no mean accurate either. One day during the warmest month is just a dab. How about in spring? Or winter or fall when there is less cyclists? I’m glad to see these numbers but come back when you have many more days of data in different climate. Do not pass of weak data research to invalidate other weak data. Miya, it’s common for planners to estimate the capacity needed on a street by measuring its peak. The US Federal Highway Administration (http://www.fhwa.dot.gov/ohim/hpmsmanl/appn.cfm) measures capacity using “peak lanes” (number of through lanes used in the peak period in the peak direction). It makes sense then that taking a busy Spring day like June 14 (it’s not even summer yet) to create a model for determining the capacity of our streets for bicycles. At any rate, the John Street report is trying to pass off a number for which there doesn’t seem to be any measurement backing it up at all. Any kind of count, then, would be better than what they actually passed off as data. Good work. I too have noticed City Planning reports that greatly play down the amount of traffic created by new development. I am not against development I just think the true potential impact should be known. I am currently conducting my own traffic survey and will get back to you. I’m curious: did you count the number of people in each car, or was this a study of number-of-vehicles alone? Because carpooling would change the data if you counted each cyclist and each walker as “one” but each car as only “one” as well. Counting passengers would change the data, but not much because there wouldn’t be many of them. 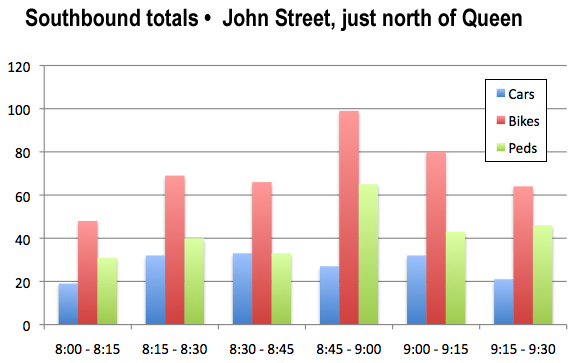 The “north of Queen” count is kinda useless because John St. doesn’t really go anywhere north of Queen. Just a couple small office buildings, a bike shop and Grange Park. No through traffic for cars but cyclists and pedestrians cut through Grange Park and contribute to a high count. @Jen – In terms of road capacity, one car takes up the same amount of space regardless of occupancy. While multiple occupant bicycles are rare, they do exist and work much the same way. A tandem is slightly larger than a single bike – much a like a minivan being larger than a sports car – but takes up essentially the same amount of space. Two pedestrians take up twice as much space as one. 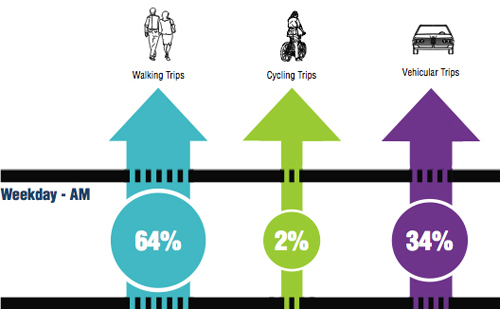 So one car, one pedestrian, one bicycle is a fair comparison of traffic volumes. Thanks for your reply! I ask because from what you said about the initial survey—“Were they actually suggesting that if you took a random group of one hundred people on John Street (pedestrians, drivers, and cyclists) that only TWO would be on a bike?”—it seems like the initial survey was counting per-person, not per-vehicle. Is this true? If your subsequent study counted per vehicle, it was using a different form of measurement, and it might help to emphasize that difference (since part of what you are arguing is that a per-person count isn’t useful for traffic patterns). Wow, that’s some pretty harsh (and hand-wavy) criticism. Until they release the source data, the city doesn’t have anything to back up what they are saying, and a cursory examination of what they said appears to be wrong…when will they release the source data and prove themselves right? I am guessing that they haven’t released the source data because either it doesn’t exist, or is going to show flaws in their methodology…otherwise why not just release it now? I find it even more odd that cars+pedestrians always add to a constant 98% at all times of the day and week, just so that the remainder would yield 2% for cyclists. There’s reason to believe that the cars and pedestrians numbers may have been fudged as well. This sounds like a simple abuse of our public space. That is the term “Cultural Corridor” sounds to me like a euphemism for the privatization John Street. If CHUM/CTV/MUCH etc needs space for it’s events, and if Hooters/Jack Astors et al want larger patios, then let them BUY John Street from the city and they can do what ever the hell they want with their private property. But I don’t see why I am being asked to subsidise those private businesses with my tax dollars. especially with the additional expense of my safety. I’m so impressed to read that a group of people would volunteer their time to count traffic at 8am to make-up for the poor job that the city is doing. It gives me hope for this city to read stuff like this. That’s how it works, I guess. Bicycle use is dead last in design consideration: no accommodation in street design and bicycle parking will be centralized and concealed. Traffic engineers are familiar with the concept of “induced traffic,” in which a road addition or improvement will actually attract new trips. I would think you can take this the next step and logically assert (using traffic engineer-think) that bike lane additions/improvements would increase this “mode split” even more. If the percentage is this high in the absence of bike lanes, how much higher will it be if they are added?